The first figure in the circle gives the spring rate, the second the fall rate where the outcome of the highlighted circles is shown by the arrow. 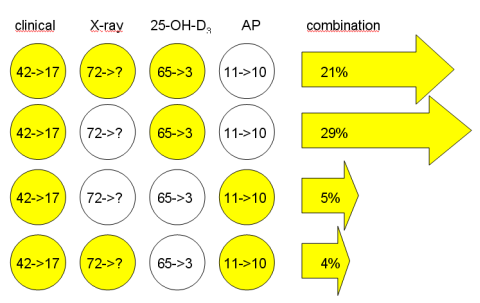 It is a vexing picture – X-ray and AP percentages are quite stable, X-ray high and AP low; symptoms and 25-OH-D3 highly variable. What is the true rickets prevalence? Previous PostRandomNext PostIs utilitarian moral judgment hosted by the prefrontal cortex?